Bungee Jumping Travel Insurance, we compare policies covering accidents, medical emergencies and repatriation, loss of earning and personal accident. Bungee jumping is an extreme sport and involves jumping from a large height relying on a large elastic cord that is attached to a large usually static object. Once the jump has been made the elastic cord continues to oscillate up and down until all of the energy has been dissipated. Bungee jumping can happen from buildings, bridges or even helicopters. It is very popular in the USA, Canada and New Zealand. Bungee jumping is extremely popular amongst backpackers. Although bungee jumping is a relatively new activity having only been around for 30 years it has evolved within that time from having only your ankles attached to the elastic cord to your body with a body harness. It is important to ensure that your insurance fully covers the whole bungee jumping experience as when you’re jumping from a great height the last thing you want to be worried about is your insurance policy! It is also essential to ensure that all aspects of your trip are covered by your insurance policy, not just the bungee jumping, so always remember to read all the terms and conditions carefully. If you are unhappy with your policy you do have a 14 day cooling off period with any insurance policy you take out. If you don’t go bungee jumping every holiday it may be a good idea to look at a single trip or even single day or activity policy instead of an annual travel insurance policy. Listed below are a number of available insurance policies to cover bungee jumping, however it is recommended that you read the policy carefully to ensure that it covers all your requirements. JS Travel Insurance specialises in sports and activities and offer bungee jumping within their travel insurance so long as it is adequately supervised and the recommended safety equipment is worn. However, please be aware that with JS Travel Insurance there is no personal accident cover. The Post Office offers you the option of adding bungee jumping as a sport to your insurance policy. Be aware, this policy does limit you to a single jump, but is available on both single trip and annual policies. Flexicover also offers bungee jumping cover within their travel insurance policy at no extra cost, however the bungee jumping has to be completed within organisers guidelines, as well as the recommended safety equipment being worn and the local laws and regulations being complied with. 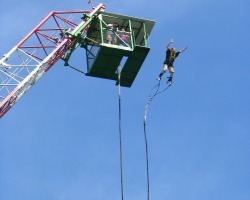 SportsCover Direct offer several different types of insurance to cover bungee jumping. They offer an annual trip, single trip or ‘ActivityTop Up’. Annual trip policies will cover bungee jumper for all the trips you make within the year whereas single trip policy will only cover the trip you take it out for. ‘ActivityTop Up’ means that there is no need to duplicate insurance policies, the ‘ActivityTop Up’ will just cover the bungee jumping experience if it is not included within your original insurance. This could be useful for back-packers or those only participating for a day as a one off. It is very important to check the safety records of any bungee jumping site before taking a jump and also get a professional to check all your equipment and prepare you for your jump. Injuries from bungee jumping can as small as cord burns and headaches but as serious as whiplash and haemorrhages. Although there are apparent high risks involved with bungee jumping many of the jump sites around the world have extremely good safety records, due to the fail safe mechanisms introduced to protect jumpers.